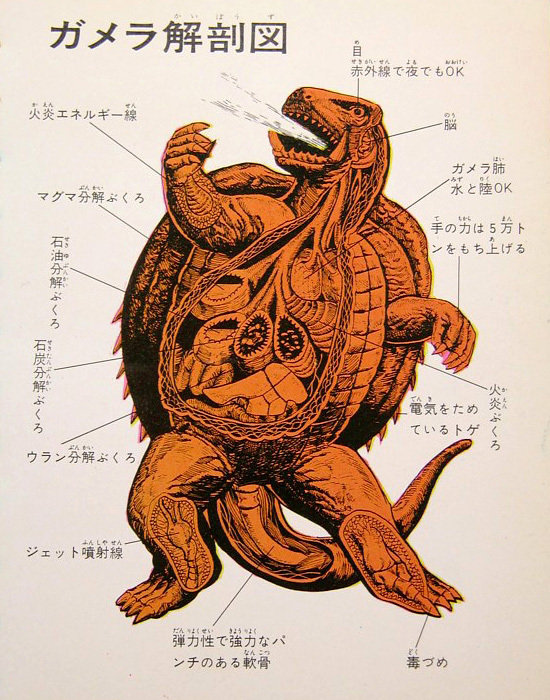 The anatomical features of Gamera and his foes are detailed in a set of illustrations found in one volume of the Kaijū-Kaijin Daizenshū movie monster book series published by Keibunsha in 1972. 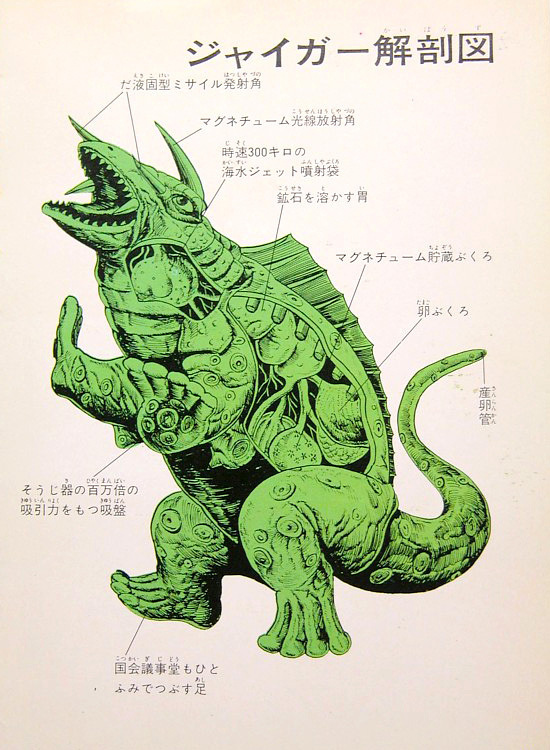 Gamera's features include infrared eyes with night vision, arms that can lift 50,000 tons, an organ for producing the flames he shoots from his hands, electrical spikes on his back, poison claws, sac-like organs for storing lava, coal, oil and uranium, balloon-like organs that blast jets of air out through the feet, and a tail of elastic cartilage that can deliver a powerful punch. Guiron's most prominent feature is his knife-shaped head, which is 100 times harder than diamond and is packed with shuriken-like stars that can be fired from a pair of openings above the eyes. 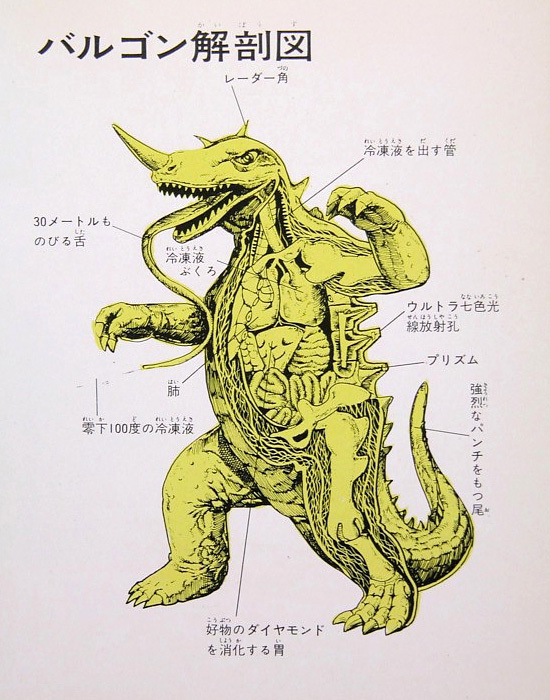 The creature has 360-degree radar vision, 60 times more teeth than a piranha, lungs adapted for long-distance space travel, sac-like organs for storing energy and uranium, balloon-like organs in the legs that blast jets of liquid through the feet, webbed fins for stability in water, and magnetic suction cups on the hands. Barugon's features include dorsal spikes that produce a deadly rainbow ray, an organ to produce frosty liquid (-100 degree Celsius) that can be shot from his 30-meter-long weaponized tongue, a stomach that can digest diamonds (his favorite food), and radar horns atop his head. 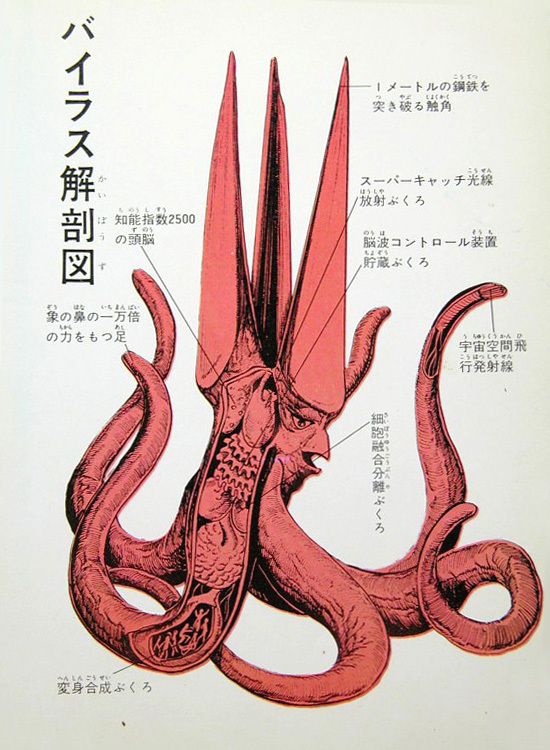 Viras's features include a spike-shaped head capable of piercing through a meter of steel, a brain with an IQ of 2500, organs for producing a force field and controlling the minds of others, tentacles that are 10,000 times stronger than an elephant's trunk and which can emit powerful beams for space travel, and organs to break down cell tissue and control metamorphosis (for creating its human disguise). Jiger's features include a pair of horns that shoot missiles made of hardened saliva and one that fires a deadly "magnetium" beam, powerful suction cups covering her entire body, an organ for shooting jets of seawater at 300 kilometers per hour, a stomach that can melt iron ore, and an ovipositor tail. What is the little sac full of people in Viras's arm (at the very bottom of the diagram)? That's kind of disturbing. 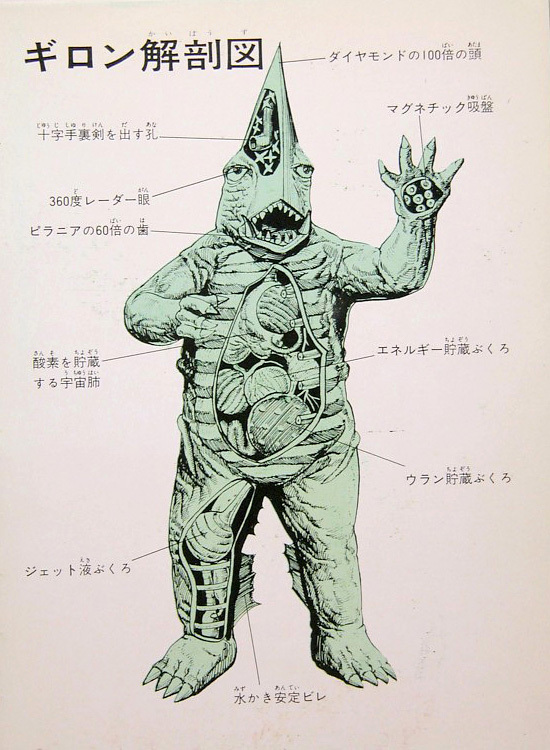 "organs to break down cell tissue and control metamorphosis (for creating its human disguise)"
is there any chance to buy this book somewhere/online? Oh wow, I want this series framed and on the wall. Would love to have prints of these or just hi-res scans so that I could make my own. The entire series is beautiful.